As probably noticed many months went by without any activity on this website. At first Arnold encountered difficulties with the web site host, which led to the shut down of the site some time ago. As Arnold pursued a long time felt urge for another British bike brand, he sold off his long time owned Triumph 3SW. He left us with the option of taking over the web site and we, Jork and Edwin, accepted this challenge. Although we’re youngsters in comparison to Arnold, we accepted the challenge to keep the web site alive and to feed you all with information about these great bikes. Lets see what our 10 – 15 years of Triumph experience will bring us! If you have any questions, remarks or suggestions, please let us know as we’re always open for another view, as long as it is positive! 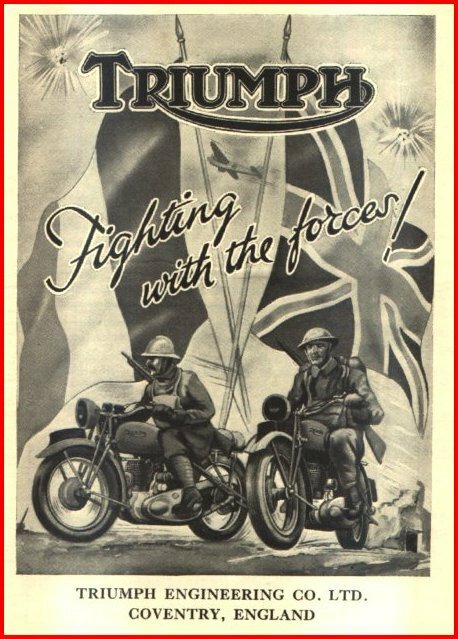 For this website we will focus us on the War Department Triumph motorcycles from the 1937 – 1945 era. We’re aware of civilian models like the 3H and Speedtwin as well as the WD prototypes like the 3TW and 5TW which were used. We’ll stick to the 3SW, 5SW and the 3HW being the majority of the Triumph motorcycles delivered to the British Ministry of Defense. With this website we’ll try to share details of parts as well as general information, so you are able to recognize parts and prevent you from making the same mistakes that we did when scouting for parts. Throughout the years we’ve encountered some challenges with wear and tear parts for which we’ve found solutions. Sharing these solutions will either way provide you with a solution or another view of how it could be resolved. In the end we would like you to enjoy these great bikes and keep them on the road as best as possible. If you have any questions, remarks or additional information, please let us know, so it can be shared.